Easily the best film of the year and possibly the best film of the decade. Made for eVERYONE. Rated PG-13 for sequences of violence and action throughout. The name Christopher Nolan should be household name. If you don’t know it, remember it. Everyone knows who Steven Spielberg and Martin Scorsese are; there is no reason why everyone shouldn’t know Christopher Nolan. Filled with odd and unforgettable images and revealing almost nothing about the story, the teaser trailers for Inception began running nearly a year ago. Even the most recent trailers and television spots have hardly given you any insight to the plot. There are a few reasons for that: one, the images they showed are enough to make you want to see it; two, the story is a bit too complicated to explain in two and a half minutes; and three, this is one of those rare films where the less you know prior to seeing it, the better it is. But if you are dying for it, here it is. Dom Cobb (Leonardo DiCaprio, Shutter Island) is the leader of a team hired by corporations to enter the dreams of their competitors and uncover their business secrets hidden within. This is where the heist comes in. Dom’s role is not only as the leader, but the “extractor” – the player with enough smarts to find the secret and take it out into the real world. Every heist needs a great team, so Dom assembles the best of the best. Joseph Gordon-Levitt ((500) Days Of Summer) plays Arthur, Dom’s point man. Although his character is used for slight comic relief and exposition, Gordon-Levitt is still just as fun to watch as ever. You never may have pictured him in one, but he is fantastic in action scenes. One of his fight scenes in the movie is easily the best action sequence since The Matrix‘s “bullet time” shootouts. Tom Hardy (Rocknrolla) plays a role known as the “forger” – which is too cool to be explained here. You will have to see Inception to find out. He also just so happens to be pretty talented at hand-to-hand combat, making one scene in the film feel more like a G.I. Joe movie than the G.I. Joe movie itself was. Dileep Rao (Avatar, Drag Me To Hell) plays the “chemist,” whose integral role to the group is concocting unique chemical compounds that cause the dreamer to reach the proper level of sleep. Ellen Page (Juno) plays Ariadne, the newbie of the group. Just like the audience, this is her first experience with the conscience dream world. As the “architect,” her job is to create unique landscapes that unknowingly trap the dreamer in one specific place. The importance of her role lies in the fact that she must never let the dreamer know that he or she is dreaming. And Ken Watanabe (The Last Samurai, Batman Begins) is their boss. With so much at stake, he is not only funding the heist, but joining them in the dream world to make sure that everything goes as planned – which, of course, doesn’t. Cillian Murphy (28 Days Later, Batman Begins) plays Robert Fischer Jr., “the mark.” Dom and his team will enter his mind and his dreams – but this time they are not doing a routine job. No, this time they will attempt something that has never before been done. And you will just have to see Inception to find out what that is, how they plan do it and if it is even possible. Anyone who gives it bad review or doesn’t like it simply doesn’t understand it. While it is completely captivating and entertaining upon first viewing, it will definitely take multiple viewings to grasp absolutely everything that is in it. Meeting the qualifications for “summer blockbuster” with big actors and plenty of explosions, Inception reminds us that blockbusters can be deep, high quality films too. They don’t all have to be as mindless as the Transformers movies to win people over. Expect to see Inception amongst the Best Picture nominees come awards season. Aside from District 9, you rarely see that from a summer blockbuster. 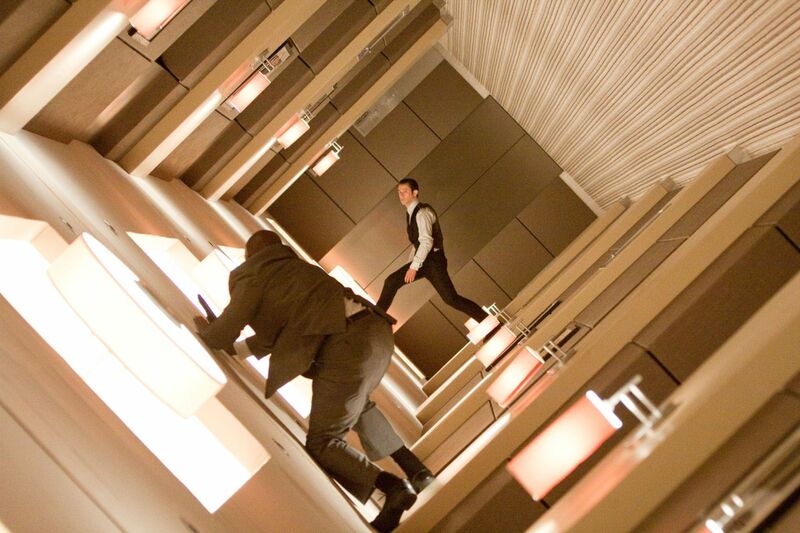 You can’t really compare Inception to any other movie because there has never quite been a film like it. But you can compare Inception to The Matrix in the way that you leave the theater after seeing it. I remember seeing The Matrix on opening day and having my mind blown. For two days, I could not stop thinking about it. The originality of it all had me analyzing and reanalyzing it over and over again. Inception will do the exact same thing to you. The things it does are mind-blowing. You have never seen anything like this before and it will probably be a long time before you see something like it again. Just as he met and passed the audience’s expectations of The Dark Knight, Christopher Nolan has done it again with Inception. Inception is the high-quality well-rounded film that we have been waiting for for a long time. There isn’t a single flaw to be found in it. It is absolutely perfect in every way. There is no reason why it should not reach the heights of Avatar to become the highest grossing film of all time, so lets get it there. Stop read, shut your computer off, get up and go see it. You have no idea what you are in for.